After turning the mode select switch on, turn the ignition switch on. 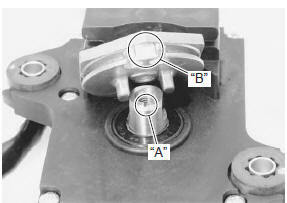 Check that the cable slots of the excva pulley comes to the middle (adjustment position) “a”. 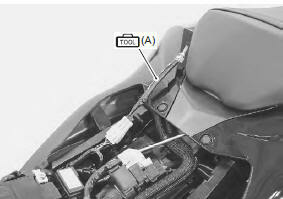 before removing the excva, be sure to set the excva pulley to the adjustment position. 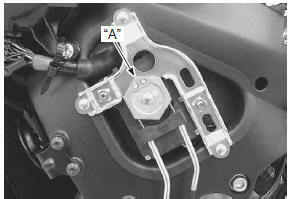 Disconnect the excva coupler (1). Remove the excv cables (2). Refer to “excv cable removal and installation” . 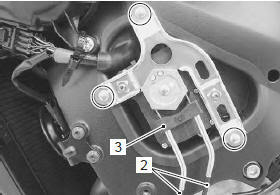 Remove the excva (3) with the bracket. 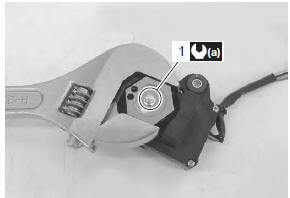 Hold the pulley with an adjustable wrench, and loosen the pulley mounting bolt (4). when loosening or tightening the pulley bolt, be sure to fix the pulley with an adjustable wrench, or excva may get damaged. Do not use the adjustable wrench to turn excva pulley so as not to cause damage to the internal gear of excva. Remove the pulley from the excva body. install the excva pulley to the shaft. align the shaft’s line “a” and cable slots “b”. Hold the pulley with an adjustable wrench, and then tighten the pulley mounting bolt (1) to the specified torque. Install the excv cables. Refer to “excv cable removal and installation” . Adjust the excva. Refer to “excva adjustment” . Refer to “dtc “c46” (p1657-h/l or p1658): excv actuator circuit malfunction” in section 1a (page 1a- 109).